I was babysitting again today and we spent a good part of the morning playing “camp/ picnic” with miniature things. I like this lunch we assembled. 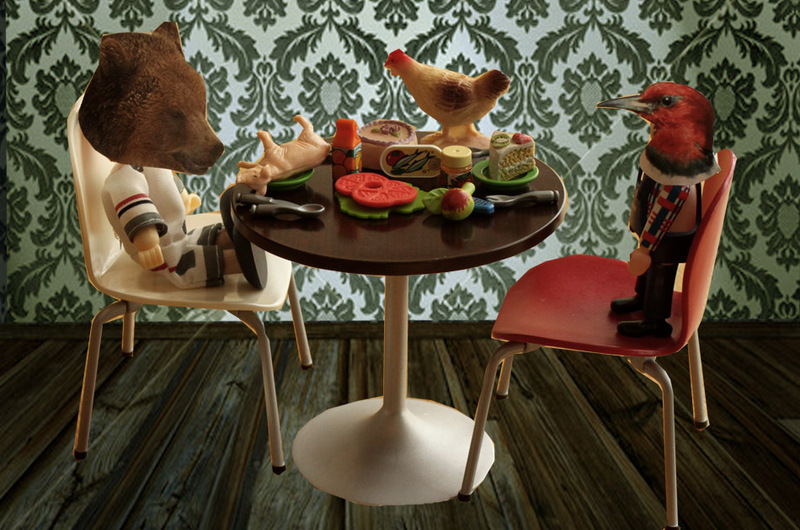 Pig, chicken, orange juice, lettuce, tomatoes, an apple, sardines, jelly (or is it jam?) and cake. mmmm! Thank you Nicolette Wong for bringing life to these two creatures. 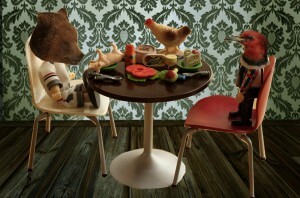 Check out her vignette “Toys” about Bear and Woodpecker on her blog “100 Days 2011 – Le Bleu du Ciel”. This entry was posted in Updated with Collaboration and tagged Collaboration, Updated. Bookmark the permalink. Post a comment or leave a trackback: Trackback URL. This image really struck me – and I wrote a post surrounding these two creatures for 100 Days 2011. Enjoyed the rest of your posts too. Thanks for sharing your creativity.